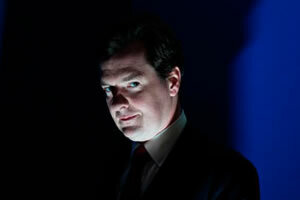 George Osborne "stands ready" to help Ireland in the midst of economic crisis. It's the least he can do after cheerleading their disastrous economic policies as a "shining example". George Osborne “stands ready” to help Ireland in the midst of economic crisis. It’s the least he can do after cheerleading their disastrous economic policies. A generation ago, the very idea that a British politician would go to Ireland to see how to run an economy would have been laughable… Today things are different. Ireland stands as a shining example of the art of the possible in long-term economic policymaking, and that is why I am in Dublin: to listen and to learn. The story now is rather different as Irish unemployment stands at 13.9 per cent while GDP contracted again in the second quarter. Tory cheerleaders including politicians, think tanks, and bloggers praised the Irish decision to reject a stimulus package similar to the policies of Alistair Darling and Barack Obama. They went on to praise Irish Finance Minister Brian Lenihan’s austerity budget a year ago. Now they say it would all be fine if it wasn’t for the euro or bank bailout. Yet even before the bank bail out, the cuts weren’t working as growth plummeted and the deficit remained stubbornly in double digits. George Osborne wants to help Ireland in the “steps that it needs to take to bring about that stability.” But with his track record can we trust him to make the right judgment on what those steps might be? Good piece. Osborne’s co-thinkers in Dublin have provided a lab-like experiment in the effects of ‘fiscal adjustment’ via tax increases and spending cuts. This not only led to disastrous economic effects, but the public sector deficit has doubled. This because aren’t savings, they’re simply cuts, which have a negative impact on growth and therefore depress taxation revenues and boost welfare outlays- even as welare entitlements are slashed. What the advocates of similar policies here and elsewhere need to explain, is why the cuts will have a different effect here? I’m not an economist but even I’m aware of the problems that blight Ireland and where they came from. On a trip there to visit family I noticed how everyone seemd to be driving flashy cars and were making nice their homes… all on credit apparently. Coupled with interest rates that were too low (EMU) debt spiralled and when the crash came this left the Irish particularly vulnerable. Now they owe huge amounts (public and private) and the cost of government debt is rocketing, meaning tax receipts are going on servicing that debt and not on the people. Now correct me if I’m wrong but isn’t it cheaper to make JSA (equivalent) payments than to fund salaries? If tax goes up people will not be able to save and spending will decrease, which will reduce economic activity and also reduce tax receipts further? It seems to me that for a country that can only afford to continue running upto June that worrying about the quality of services is like fiddling whilst Rome burns. It’s all hands to the pumps and there isn’t space on board for a diversity officer – irrespective of their social value. I’m happy to stand corrected but I don’t see how spending more on job positions that will not directly contribute to the economy in this situation is sensible. Will – Going back to comments someone made in 2006 is just lazy and you should do better. He also stated he was there to learn. Can we assume that in the world of Will Straw people aren’t open to have their opinions changed? Would people criticise your dad, Jack Straw, for his CND membership in the past? Of course not – that would be equally as ridiculous as this article. The fact is the left is completely rudderless at present and for reasons I do not know Labour seems determined to hold views that may play well to the gallery but I’m afraid the electorate who aren’t listening will simply not vote for. I like Ed Miliband, (despite wanting his brother to win) but unless Labour gets a team like (shudder) Mandelson, Campbell etc to renew the party I feel it will be doomed to opposition. It’s scary that Osborne has such terrible judgement on the economy – & so recently. After all, he was Shadow Chancellor in 2006, not a student politician. After reading his 2006 article, we should be sceptical that he has any idea what he’s doing. Sadly, millions of people are likely to suffer as a result of his neo-Hooverite ideological obsessions. Henry – It would be hard to argue he was less experienced than Alan Johnson and that’s in Johnson’s own words! Why aren’t you SCREAMING about this from the rooftops? Anon: I was talking about judgement, not experience. And Johnson – for all his faults – has held a number of senior governmental positions without making a fool of himself. Henry – So you are saying that Alan Johnson (who I think may have made Labour electable after Brown, Miliband won’t) could have predicted the recession any more than anyone? The fact is that the current chancellor has been proven right so far on the important current financial events. There has been no double dip recession, unemployment is down and the country’s credit rating has held up. Have you ever considered how good the coalition will look in five years with the economy turned round and a lot of the deficit cleared? The Lib Dems have already started on their no tax for up to £10K earnings – something that won’t affect the average Labour voter it appears but after the shock of redundancy followed by self employment then the recession I for one welcome it. Certainly it is preferable to the last government where the 10p tax was removed (cruel) and they wanted to put up NI. I’m just saying that Osborne made a fool of himself praising the Irish economy in 2006. The Irish government are his ideological soulmates – & now he’s apparently thinking of giving his chums there £7 billion of our money after they completely messed up their economy.